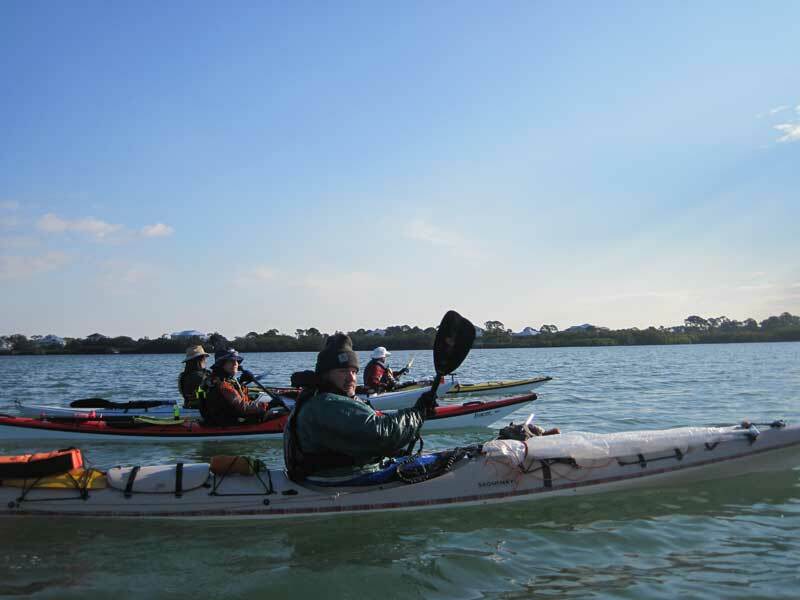 At 7:00 am on March 2, 2013, conch horns and bagpipes sounded and race organizers gave the signal for participants in the Everglades Challenge and Ultra Marathon to launch their boats and start down the course. Getting under way is easier for some racers than others. 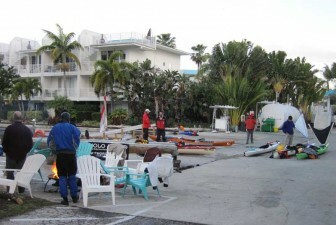 In the foreground, a kayaker is able to pick up his loaded sit-on-top and carry it down the beach to avoid scratching the hull. That's packing light, considering all the gear they are required to carry! In the background, a racer in a Triak was quickest to get under way and is paddling across the sand bar before most boats were even in the water. 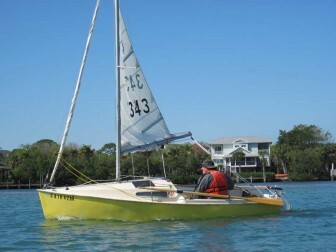 Getting a quick start in this race is not as important as it is in most boat races. A good finishing time depends more on the ability to keep moving than anything else. At left, Watertriber LeatherLungs shoves his Northeaster Dory designed by Chesapeake Light Craft down the beach. 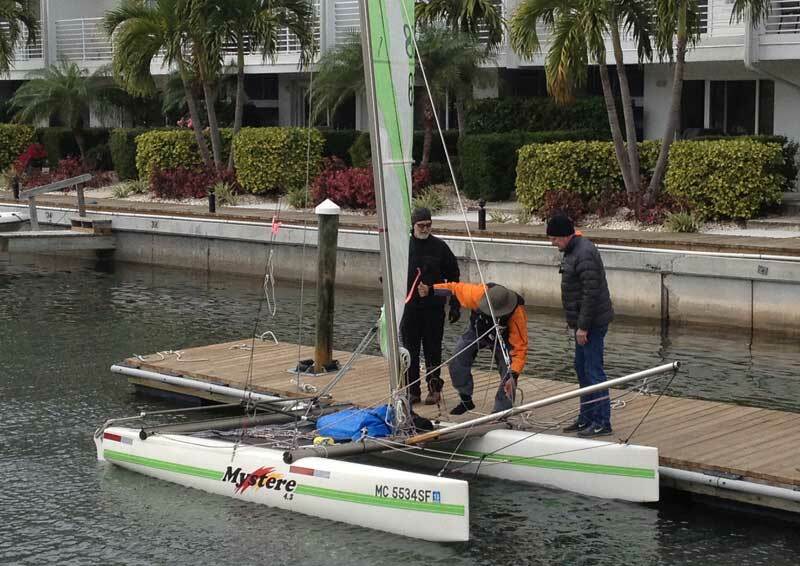 He was one of only two sailboat racers to finish last year's particularly tough Everglades Challenge, fighting fierce headwinds virtually the whole way. The sailors had a much easier time of it this year, with strong tailwinds most of the time. In the background, a sailor is getting underway in one of two prams to enter this year. 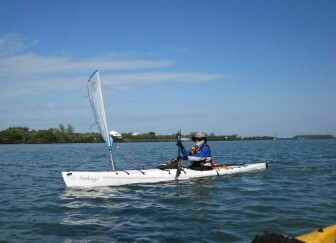 Soon the water off the Fort Desoto Park beach was starting to fill with kayaks, expedition canoes and sailboats. 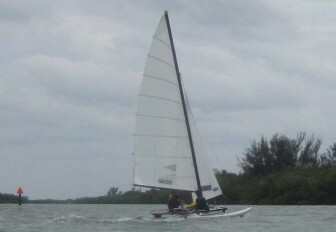 In the foreground is the homebuilt trimaran Finger Mullet. 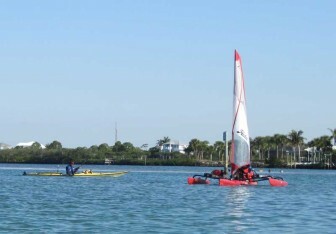 In the background are Hobie and Mystere catamarans sailing out among the fleet of kayaks, along with a Kroger canoe and a Hobie Tandem Adventure Island. 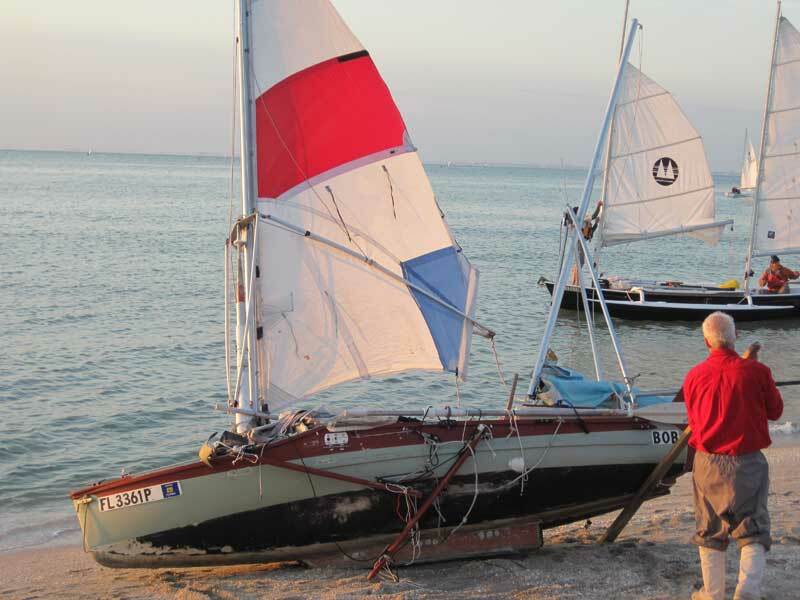 A beautiful homebuilt trimaran with red hull gets going, keeping the rudder up to cross the sandbar just off the beach. 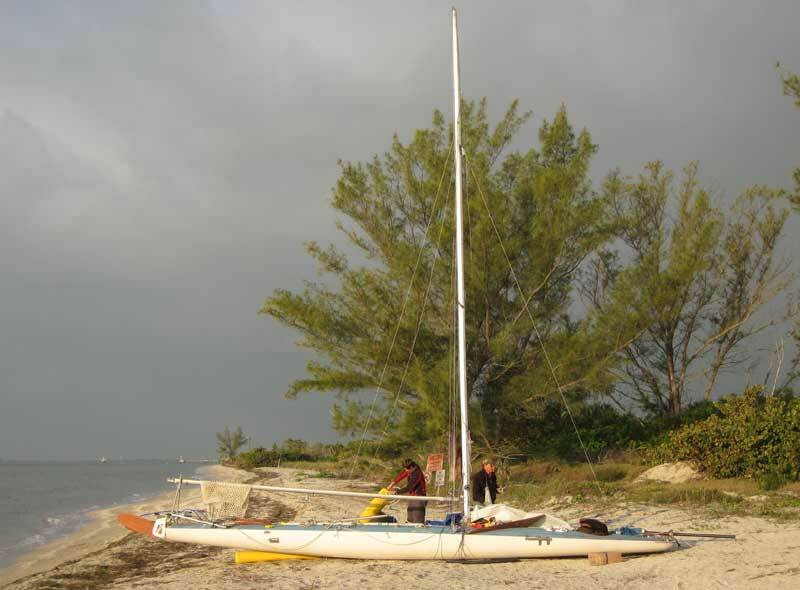 In the background, tandem paddlers with a V-shaped downwind sail rigged on the bow are headed out along with the trimaran referenced in Part 1 of this series as having "skyscraper akas." Looking at how low the amas sit in the water, I can better see the need for the high akas and trampolines! 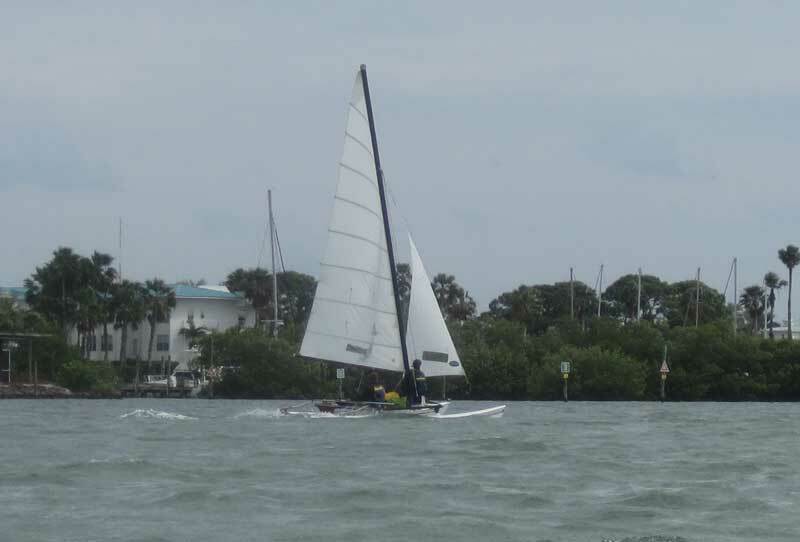 At right in the background is the very sharp looking Core Sound 17, which went on to beat the old course record in the sailboat class and take second place overall in the race. 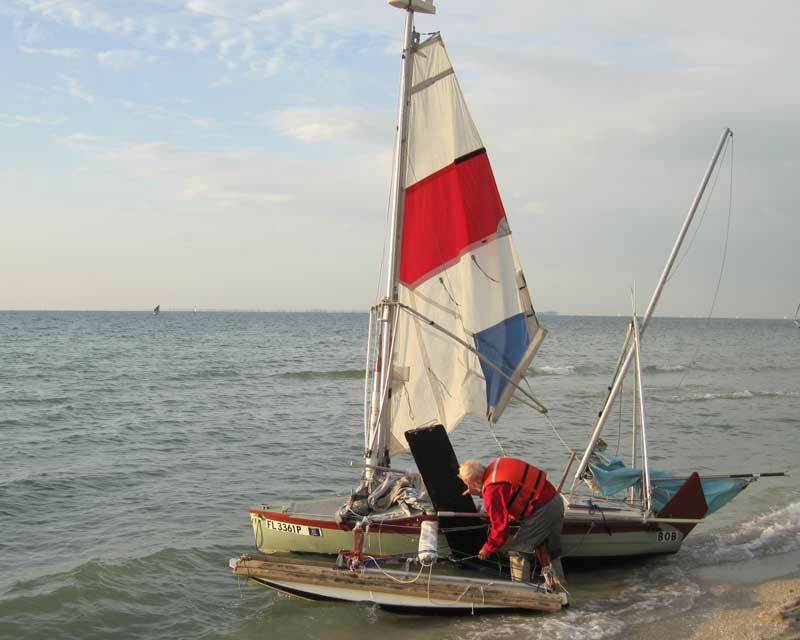 Watertribers Coastie and ClamCounter push their heavily loaded Hobie Getaway Miss Marie with pink flamingo bowsprit ornament off the beach, while in the background MicroTom and DonKeyHoTee prepare to sail off in the modified Lightning Hare On Fire. 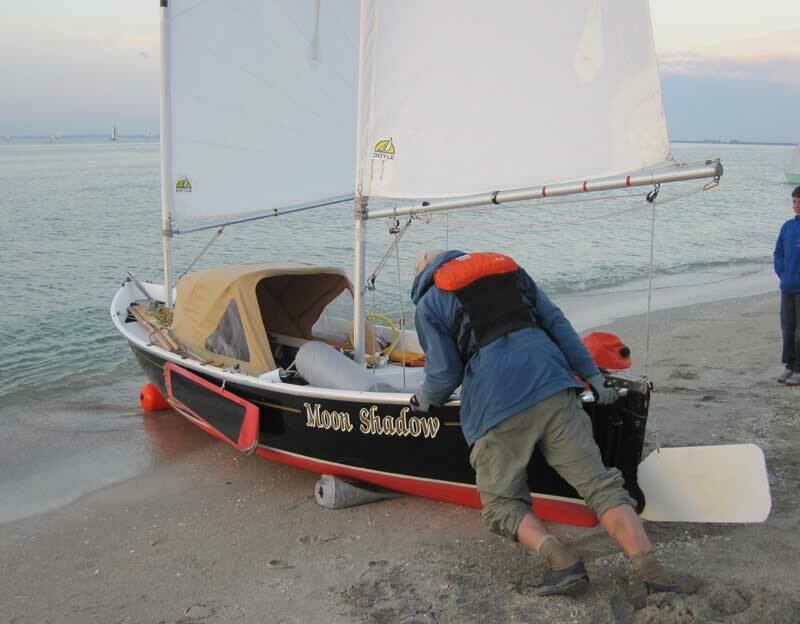 Perennial competitor Jarhead uses inflatable rollers to launch his gorgeous Sea Pearl 21 named Moon Shadow. 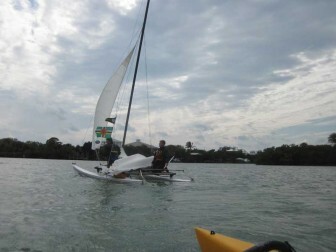 He set a new course record for single male sailors in the class 4 (sailboat) division, finishing in just under three days. 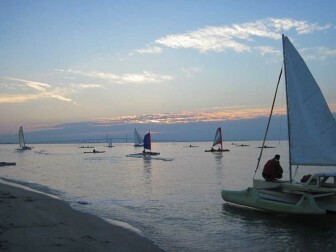 Most of the racers find a way to roll or slide their boats into the water from above the high tide line. Watertribe rules say that you must carry with you any equipment used to launch the boat. That may be one reason I have never seen a sailboat with a fixed keel in the race, until this year. 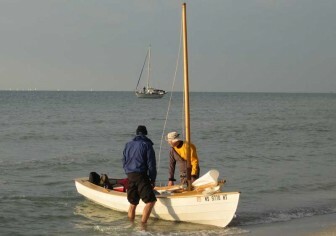 CaptShallowwater was laboriously prying his heavily modified O'Day Javelin named Bob down the beach sideways. He got one of the biggest rounds of applause from the assembled crowd on the beach when he finally got her (if we call a boat named Bob "her") floating. 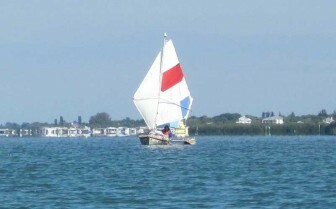 In the background, a Sea Pearl tri sailor hoists the mainsail. This beautiful wooden kayak was fascinating to me. 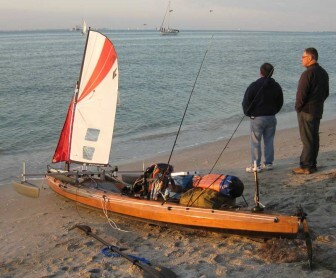 It was heavily loaded, including two fishing rods, and rigged with a miniature sloop rig and amas set far forward. Did he really intend to fish during the race? I guess so. Some treat it as more of a nature cruise than a race and fresh fish are delicious and nutritious. Lures and tackle don't weigh all that much compared to meat and they will not spoil. I just wonder where he would put a fish between catching it and cleaning it. 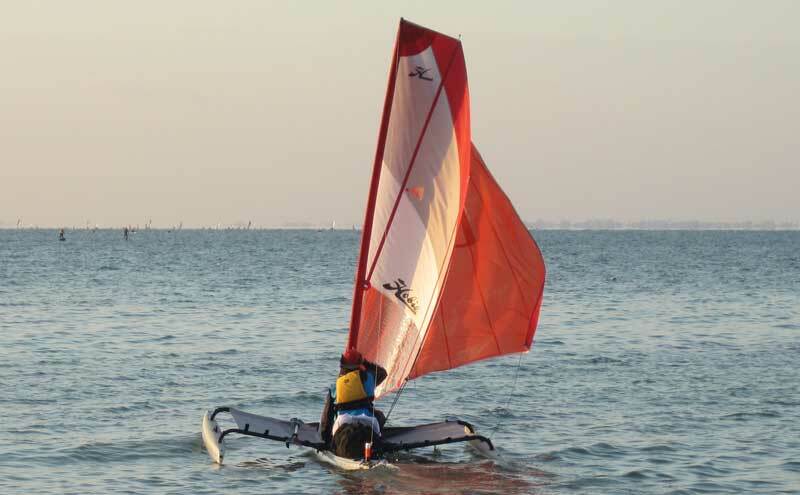 Walking down toward the Hobie Adventure Island section of beach, I saw PenguinMan heading out on his Adventure Island rigged with a red asymmetric spinnaker. He is a design engineer for Hobie Cat and they have used the Everglades Challenge as way to test and promote products in development, so this sail caused some speculation on the Hobie Adventure Island forums about whether Adventure Islands will be offered with optional spinnakers in the future. I ran into DogsLife, who was tidying up his boat on the beach, and stopped for a moment to tell him I'm an admirer of his DogsLife Adventures blog and the accompanying pictures and videos he produces. He thanked me and then politely pointed out that he was actually trying to launch his boat and I was standing right in front of it! Oops! That flagpole holding the DogsLife flag also has a GoPro camera mounted on top and the wide angle lens provides a great view of the action. Looking on as Watertribers Lugnut and Chuck the Duck posed for a departure photo, I got this picture of them posing next to the Welsford Walkabout. I just missed getting Lugnut's heroic (but not too graceful) dive into the boat on video as they shoved off, but did get some crowd reaction to it in the video below. I checked the Watertribe roster and logbook sites and learned that this little boat, which I judged the prettiest boat on the beach in the previous section, is a 15' Phoenix III Beach Cruiser designed by Ross Lillistone. 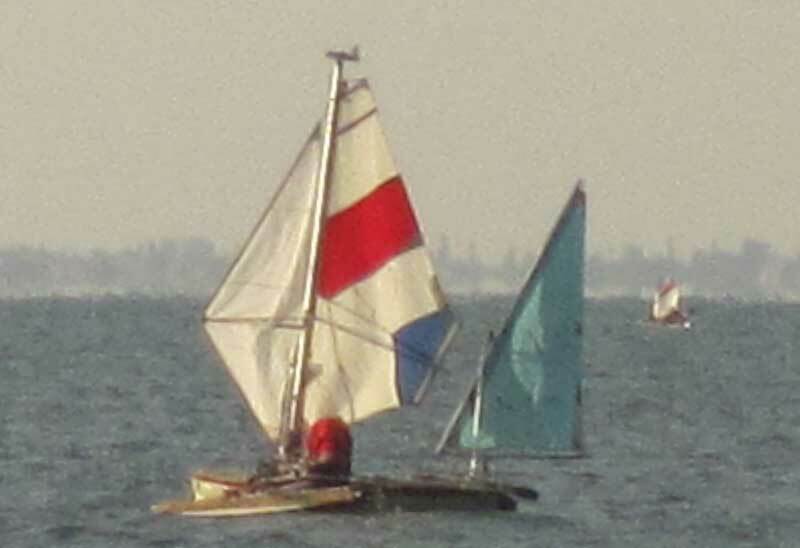 It was sailed by Watertribers Phoenix 1 and Phoenix 2, who are brothers. With most of the boats gone, a small crowd had assembled to watch CaptShallowwater rig his ama and leeboard onto the good ship Bob. He did not ever seem to be in much of a hurry, just methodically assembled his strange little boat. This was my favorite boat of all this year because everything about it is so strange. 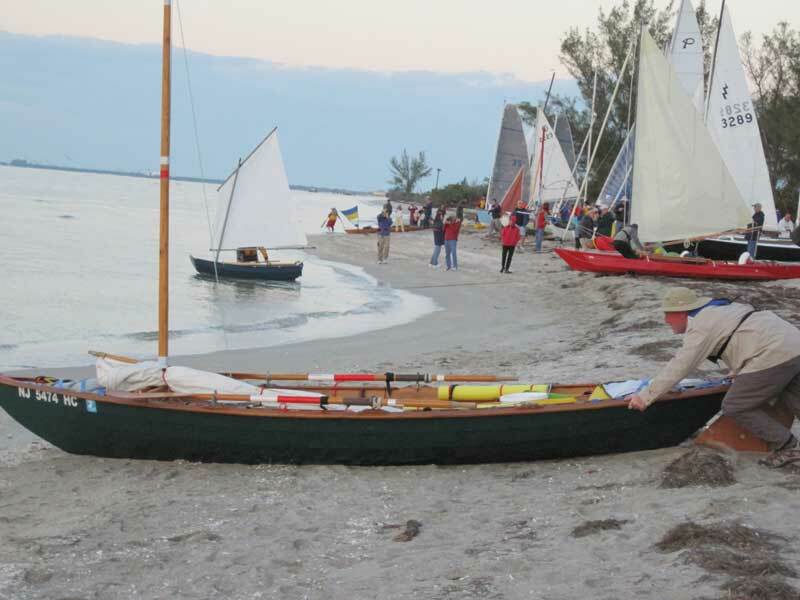 It is also the perfect illustration of what makes the Everglades Challenge (and Ultra Marathon, in which CaptShallowwater was competing) so interesting to me. Where else can you go to see a craft like this one? 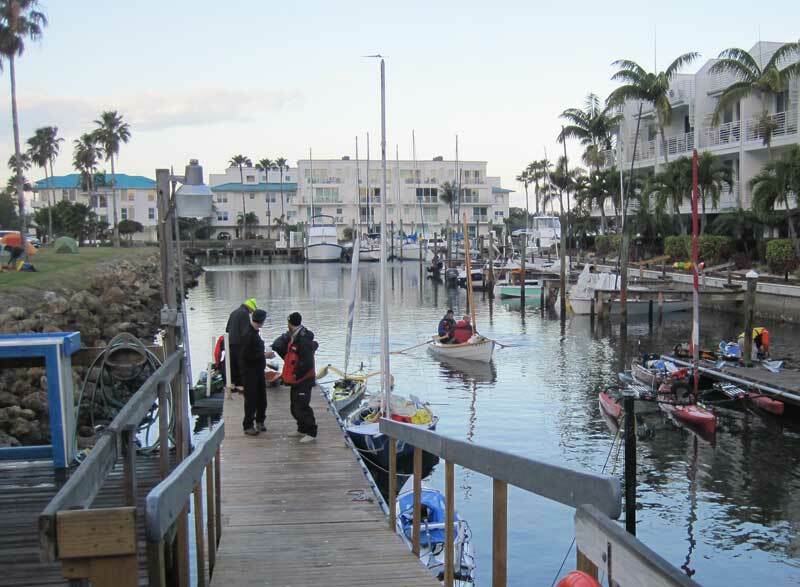 Almost all the boats had left the beach when I decided it was time for me to depart for Checkpoint 1 down at Cape Haze Marina. I really wanted to see this e-scow get under way, but wanted to allow time to have breakfast someplace along the road and still get out in the ICW before Sew Sew arrived in his Sizzor trimaran. With a strong wind at his back, I knew it would not take all that long and I was not sure how long it would take me to get down there and out on the water so I left. I heard that they withdrew from the race for the second year in a row. I hope they keep at it. 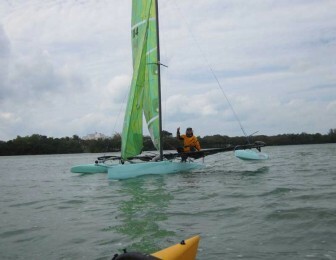 It's a fast boat and could turn in an impressive performance if it manages to complete a race. I got to Checkpoint 1 at Cape Haze Marina in plenty of time and found the staff there friendly and accomodating. 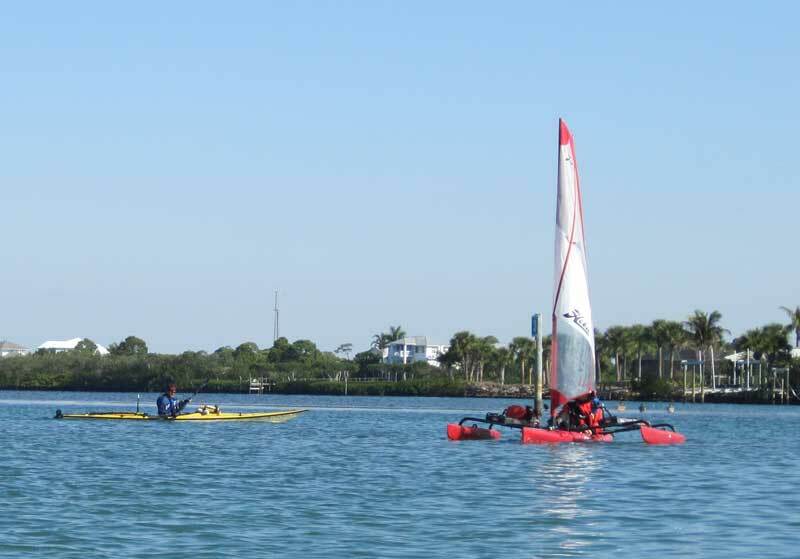 With the help of Watertriber Floatsome, I got my Adventure Island in the water and set out to sail up the Intracoastal Waterway until I found some southbound racers. I made it up to Stump Pass without seeing anyone except a couple of passing powerboats and a small group of manatees. My original plan had been to hang around just inside the pass, but the waves rolling down Lemon Bay were larger than I expected and I was getting wet and cold. Also, there is an island just inside the pass and shallow draft boats might be able to make it around the south side of it and elude my efforts to photograph them. I believe Watertribers Lugan and Heathen did take that route. I headed back down the ICW and decided to just sail around in the channel near the checkpoint, figuring that the racers would not be able to avoid me. 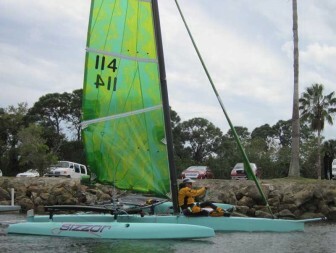 Before too long, I saw the green sails of Sew Sew's Sizzor trimaran approaching and went over to meet him. He sounded surprised when I told him that the Watertribe crew at the checkpoint had not been seeing him on the SPOT tracking system and we had all been wondering just when he would arrive. I sailed into a small waterway in Knight Island just across the channel from Cape Haze Marina to dry off, warm up, and check the Watertribe Tracking App on my iPhone to see when the next arrivals were due. I could not really read the tracking map well in the bright sunlight and it seemed to be having some issues refreshing the data, so I decided to head over into the marina. Looking up the channel as I crossed, I saw no more boats approaching, so I figured there was at least time to go in and have a look at the race managers' computers to check on when the next racers would show up. As I approached the marina floating dock, Sew Sew was departing and I got to see how he paddles Sizzor when necessary. He has a couple of stirrups up there attached to his rudder for foot steering and was moving briskly after just a couple of paddle strokes. After a short break at the marina, I headed back out to watch for the approach of the next boats in the race. As mentioned above, Lugan and Heathen took a shortcut at Stump Pass in their classic Hobie 16, but with the shallow sand bars around the marina channel, I figured they would have to sail down the Intracoastal and pass close by me. I figured wrong. 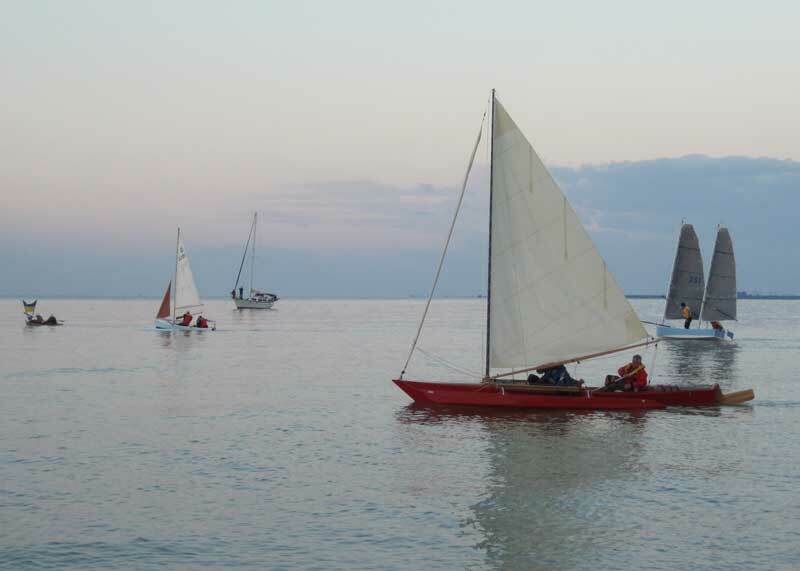 They headed across the flats and I did not want to bend my Mirage Drive or break my daggerboard trying to intercept them, which would not have been possible anyway at the speed they were traveling. 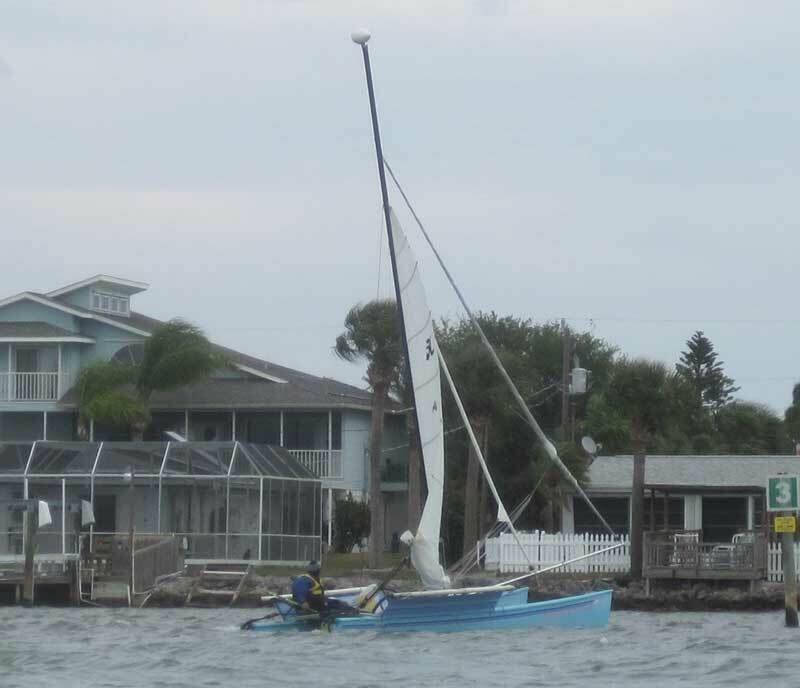 They headed out the marina channel into the ICW to drop their mainsail, allowing me to catch them there. They asked if anyone else had arrived. "Just Sew Sew. He left a little while ago." I said. "We expected that. No one else?" "Nope, you are the second ones in!" They whooped and gave each other a high five then headed in the channel to check in. I stayed out to wait for the next boat, which was not too far behind. 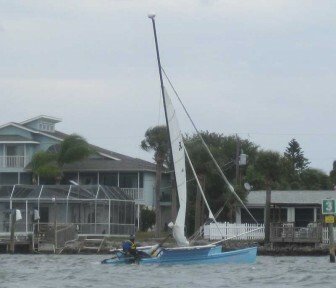 Soon I saw the modified Hobie 18 sailed solo by JustAnotherSailor coming down from Stump Pass. Again I tried to get close to take some pictures, but again I was unable to do so because he took the same route across the flats that the Hobie 16 had taken. I put some new scratches in my daggerboard trying to get close but thought better of it and headed back into the channel. 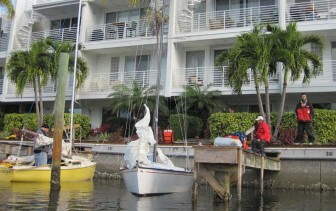 I only got a picture from a distance as he entered the marina channel under reefed mainsail. I was starting to reach the limit of my daily tolerance for getting wet and cold, but was still having fun sailing around outside the marina and got the picture at left of Heathen and Lugan departing the checkpoint. I sailed up toward Stump Pass again, hoping to encounter some more Watertribe boats, but only succeeded in getting even wetter and more cold. I missed JustAnotherSailor's departure from the checkpoint and decided not to wait for the flurry of arrivals that would take place in the hour or so before sunset. Floatsome again helped me carry my boat and the Cape Haze Marina people were nice about letting me leave my trailer with two Adventure Islands in the yard outside their kayak and SUP rental shack. I left a couple of Mirage Drive repair kits in my wife's boat where they would stay dry and told Floatsome that if it would not violate the Watertribe rules against outside assistance, any Hobie racers were welcome to grab necessary parts for emergency repairs as long as they agreed to replace them after the race. Despite being dry, he seemed to be almost as cold as I was and I could not resist mentioning that I would soon be home by a fire and drinking hot chocolate. He was too nice a guy to slap me! 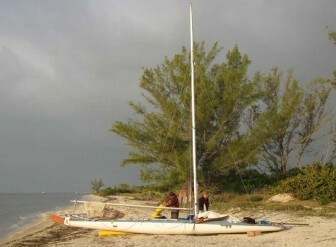 As I was leaving, Watertriber izatarock showed up in his Mystere 4.3 beach catamaran. The multihull sailboats were off to an early lead, but it is a long race. Izatarock wound up taking third place, behind the Core Sound 20 and Core Sound 17 cat-ketch monohull sailboats. 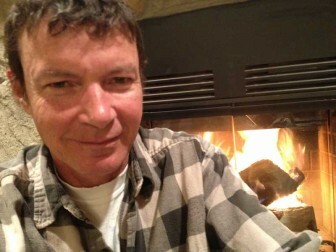 Later that evening, I built a fire in the fireplace, made some hot chocolate and sat by the fire to warm my bones. I texted the picture at left to Watertriber Floatsome. The overnight low here that night was in the low 30s and racers and checkpoint crew were freezing their buns off. The whole thing made me think that maybe the first week in April would be a better time for this event. Surprisingly, Floatsome was still willing to talk to me the next day! I arrived at Cape Haze Marina a bit late the following morning, having forgotten to disconnect my camera from the computer after downloading images. It was on all night and my only battery was stone dead. When I made it to the marina at about 7:30 in the morning, there were kayaks everywhere in the yard, sailboats tied at the docks, tents scattered around, and a bunch of lawn chairs gathered around a fire.I was surprised there were not more people around that fire, but the ones who were up and about were thinking more of getting back to the race than staying warm. 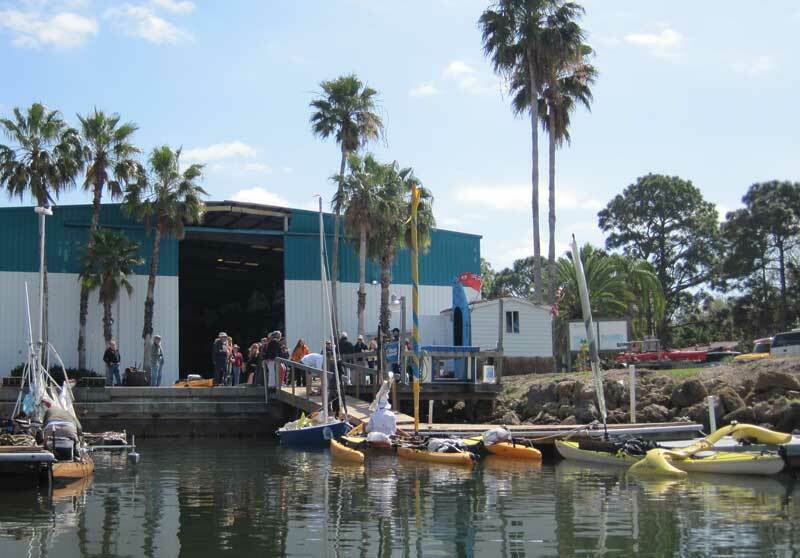 Before I asked Floatsome to once again help me with my boat, I headed over to use the marina rest room and got this picture of Phoenix 1 and Phoenix 2 arriving at the rather crowded dock area. I was bundled up in multiple layers with my Frogg Toggs on top, mittens, wool socks, the works, but the thought of them handling wet sheet lines at dawn made my hands cold. I met MicroTom and DonKeyHoTee briefly on the sea wall. 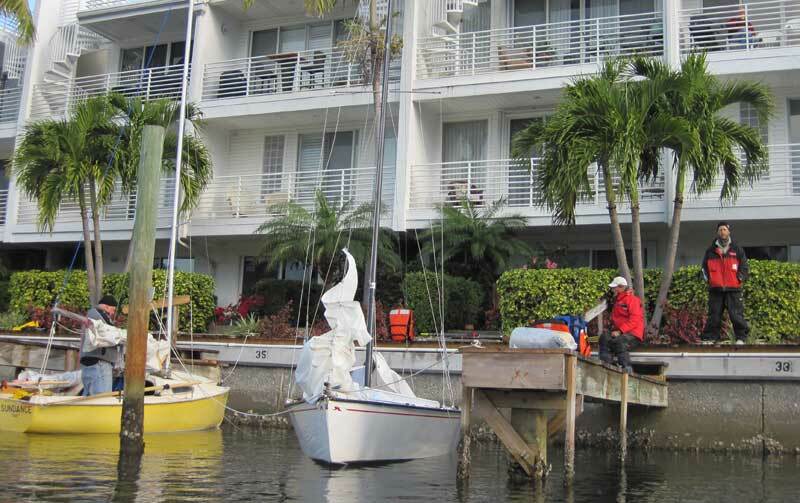 They had had a rudder failure the previous day and were discussing doing fiberglass repairs at the marina or continuing on with the partially broken rudder and picking up a replacement from their shore crew further down the course. They had a lot of things to ponder. The morning was cold, but the morning light is always nice for photographs so I got Floatsome to help me launch my Adventure Island and headed out. The picture at right shows MicroTom and DonKeyHoTee still deciding what to do next with Hare On Fire and wildblue on Sundance in the next slip preparing to get moving again. 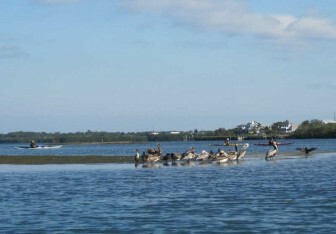 There were arrivals and departures all morning in the Intracoastal Waterway outside Checkpoint 1. 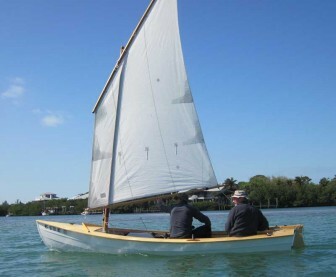 I was not out for long before Leatherlungs came out the channel in his Northeaster Dory. He was suiting up in his foul weather jacket as I snapped this picture. It was actually fairly calm and nice in the channel at that moment, but I expect he needed the reef in the sail and the jacket when he arrived in Charlotte Harbor a short time later. I saw a group of kayaks accompanied by a lone Adventure Island coming south down the channel and sailed up to meet them. They looked like some cold and tired paddlers a bit over 24 hours into the race, but they were cheerful, especially after I told them a fire was waiting for them at the checkpoint just ahead. The strong north and northeast winds after a cold front cause unusually low tides in this part of the world. 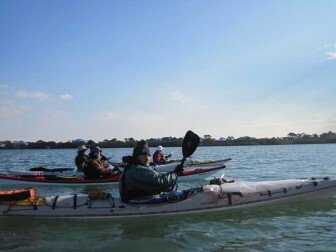 The kayak pack headed across the shallows and picked their way through exposed sand bars to take the most direct route. I could not follow in the Adventure Island with my daggerboard and rudder down for sailing but went around into the mouth of the channel to get the picture at left. Here is a shot of the yellow Adventure Island with yellow trampolines that was tagging along with the kayak pack above. It was nice sailing weather and I asked him whether something about his sail was broken since it was furled and he was just pedaling with the Mirage Drive. He explained that he was following the others because he was not quite sure how to approach the checkpoint. 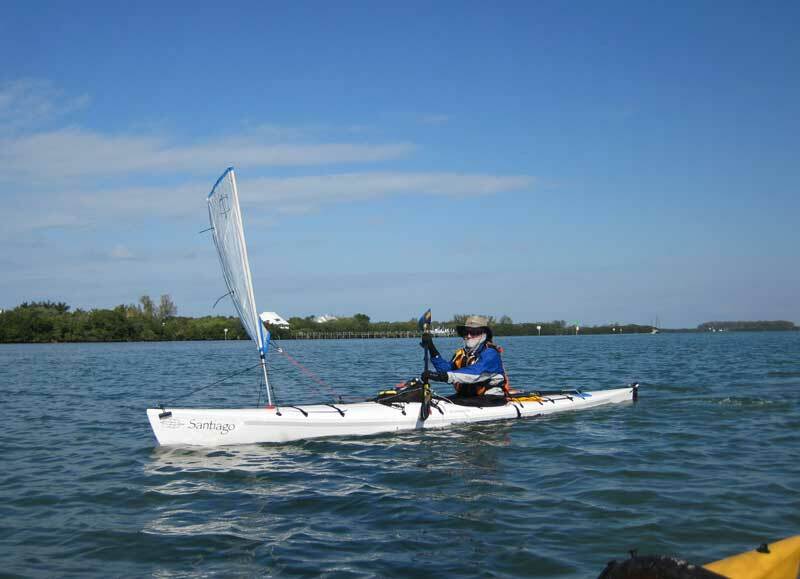 I recommended against following them across the shallows since he might bend a Mirage Drive mast, then sailed down into the channel both to demonstrate where it was and to get the above picture of the kayakers skirting the sand bars. This picture was taken as I headed back out the channel to wait for more boats coming and going. 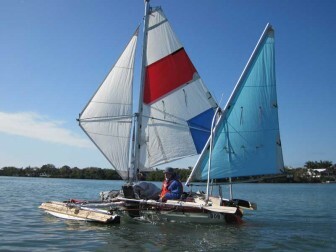 The next boat to leave was Watertriber Danito in his Kruger Sea Wind. I wish more of them would put their Tribe names on their boats. It's hard for a Speck Tater like me to figure out who goes with which boat, particularly the production kayaks and canoes. Seeing a guy in a Kruger does not really narrow it down much in this race! 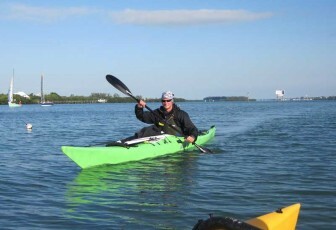 Here's an example of what I am talking about: some guy in a green kayak. I have no clue who it is, but would like to apologize. After I got my picture of Danito, I saw him coming out the channel and headed that way. He steered closer to shore. I accelerated. He steered even more toward shore, evidently trying to get out of my way. I sheeted in and started pedaling, going even faster, evidently (from his point of view) trying to get IN his way! When I got close enough, I yelled that I was not really trying to be annoying, just trying to get on the sunny side of his boat for a better picture. You can see in his wake that he then turned a bit to the right and slowed down to make it easier for me. It's a small thing and he seemed good natured about it, but one of my goals was to avoid making any racer react to my boat in any way and I would like to apologize to this guy, whoever he is, and offer him the original picture file. In the background of the picture at right, you can see two sailboats coming out. One is a Vanguard Nomad being sailed by ZerotheHero and GreenMountainGal and I'm not sure about the other one. Zero has since appeared on the Hobie Adventure Island forum's Everglades Challenge 2013 thread. Apparently, they were impressed by the performance of the Adventure Islands and are considering buying a tandem Island. I was impressed by Zero's report that they managed to stay dry most of the time, something that is not possible in an Adventure Island! Two more Kruger canoes came out next. The one at right had a fairly conventional but tiny orange sail mounted on the bow. This looks like a sail with 1 square meter of area or less, making it a downwind assistance sail that is allowed in the paddling class under Watertribe rules. At left is a more elaborate sailing rig on the same model of Kruger boat, this one with a helpful Watertribe name printed on it: DancesWithWaves. He has one of the V-shaped downwind sails on the bow, but also has a fairly large mainsail with inflatable amas and a leeboard. 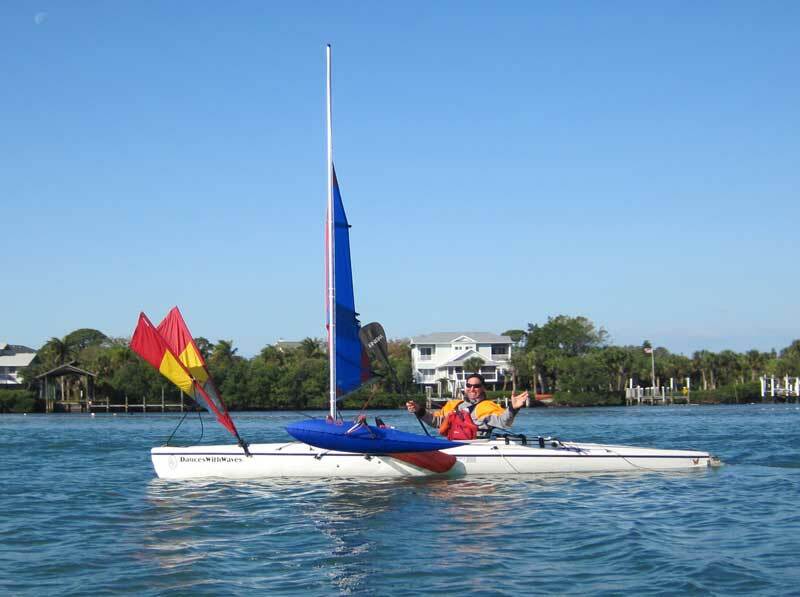 Though they are the same boat, these two are racing in different classes, with DancesWithWaves' boat in the sailing kayaks and canoes class. 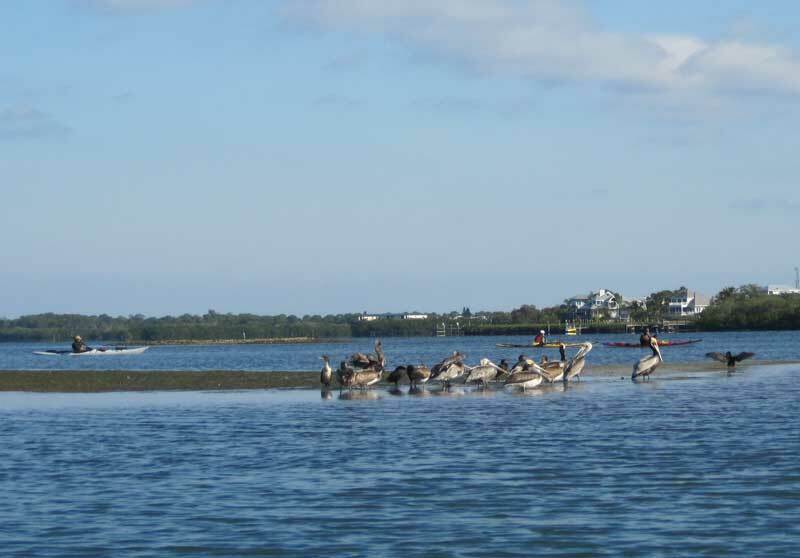 The previous afternoon, there was quite a bit of powerboat traffic in the Intracoastal Waterway. On this cold morning, there was almost none. 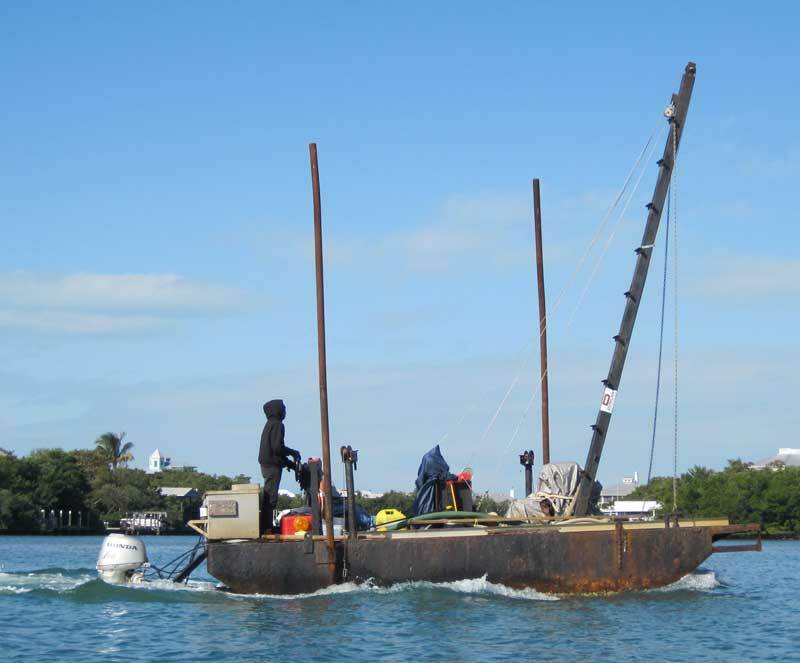 A couple of determined fishermen and this little working barge were all I saw. The driver looked cold as he powered upwind. Most of the bracket structure holding that Honda outboard was submerged, making it look like the engine was just following the boat, not attached and pushing it. MicroTom and DonKeyHoTee made the decision to continue on in Hare On Fire with their cracked rudder rather than spending time repairing it at Checkpoint 1. 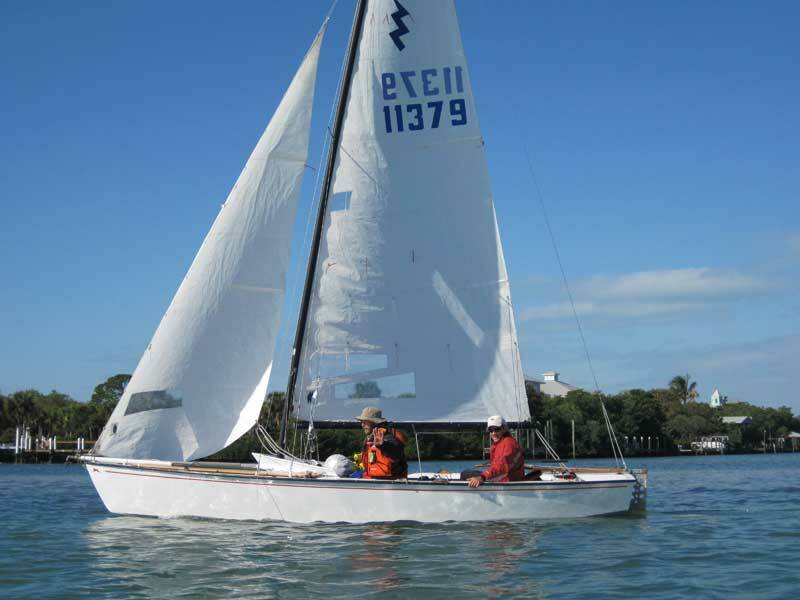 They eventually got a replacement rudder from their shore crew down at Sanibel Island, but unlike the custom rudder that cracked, it was a stock Lightning rudder that does not kick up for shallow water. 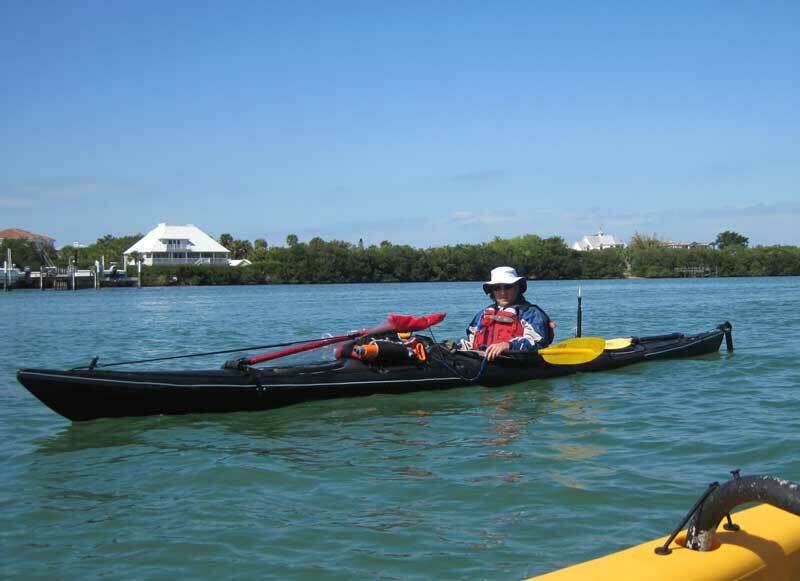 I imagine that made things a bit more difficult down in the Ten Thousand Islands and especially when crossing Florida Bay, but they made it to the finish. A repair at checkpoint one would have taken all day at least, since they would have had to wait hours for the temperature to warm up enough to allow epoxy or polyester resin to cure, then wait for the curing to finish before using the rudder. 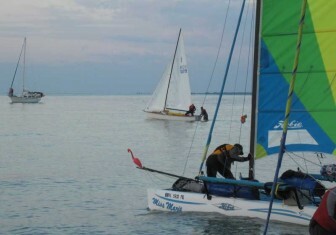 At right is a shot of Watertriber Santiago, listed in the roster as competing in a QCC700 with FEKS sail rig. So that's what that is! It looks like a fast boat and was moving well. Oddly, the Everglades Challenge 2013 results page shows him as DNF (Did Not Finish) at all checkpoints. I know he at least made it to Checkpoint 1 and this picture shows him leaving at 9:45 in the morning, well before the noon deadline for that checkpoint. There were few arrivals during the late morning hours, which surprised me a bit. I figured more competitors would camp along the way and arrive in the morning hours, but it seems that the ones who did camp got an early start and most arrived at Checkpoint 1 during the late afternoon or night. I saw that red Adventure Island at the marina dock when I arrived in the morning and the picture of him departing was taken just before 10 am. The yellow kayak coming in the channel was one of very few late morning arrivals. 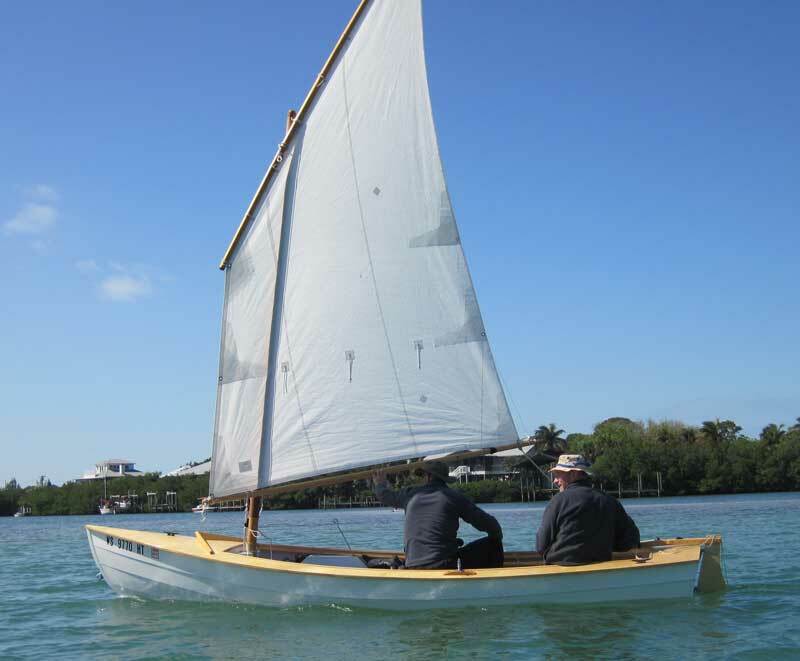 This was a moment I had been eagerly anticipating: CaptShallowWater in the profoundly strange little sailing vessel Bob coming down the Intracoastal Waterway toward me. As soon as I spotted the boat, I sailed upwind as fast as I could to meet him. 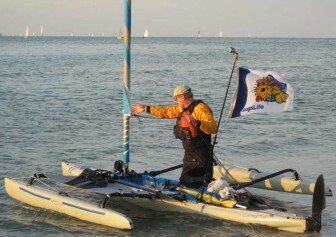 He was competing in the Ultra Marathon, which finishes at Everglades Challenge Checkpoint 1, so he was almost done with his race. 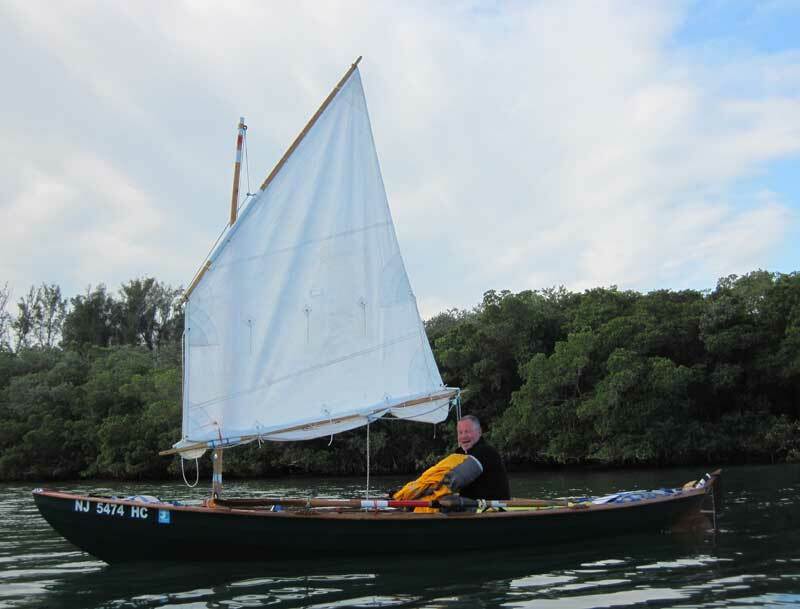 I was glad to have the opportunity to see his bizarre sailing rig at work and wanted to sail alongside and chat with him about it as he came down the channel. When I approached CaptShallowWater, I commented to him that he must be an admirer of Phil Bolger, who is noted for many unusual designs. I'm an admirer and meant it as a compliment, but CaptShallowWater seemed a bit put off by my comment and said that he had spent his life being compared to Bolger, but thought Bolger designed ugly boats. That's not true of all of his designs, some of which are quite attractive, but some are ugly and some are just plain strange. I'm most fascinated by the ugly and strange ones, which always have some practical reasons for being so ugly and strange. Having gotten off a bit on the wrong foot, I did not point out that Bob is not really the most attractive boat I have ever seen! 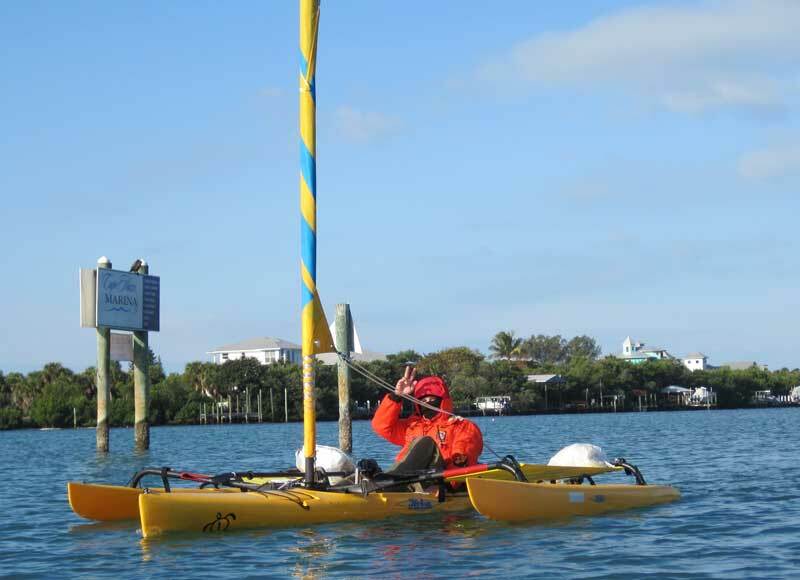 Some unusual features about Bob: the main and jib rotate around a fixed mast made from several sections of aluminum tubing, the top (tapered) section being an aluminum baseball bat. The mizzen sail is hung from a pair of wishbone masts with a support strut attached forward on the port side. The head of the mainsail has a heavy-looking headboard fixture that is attached to a short, fixed gaff boom section, and the clews of both main and jib are squared off with battens. I asked him whether the ama was really necessary, having seen that the boat has a fixed shoal keel when he was prying it off the beach at the start of the race. He said he was not really sure it was necessary, but liked the added stability when moving about on the boat in waves. He told me he had sailed the boat up from Fort Myers for the race and intended to sail it home, so he actually completed the Ultra Marathon twice, plus the Charlotte Harbor and Pine Island Sound sections of the Everglades Challenge. I did not have the heart to tell him that I thought Bob was every bit as strange and ugly as any Phil Bolger design, but really I mean that as high praise! 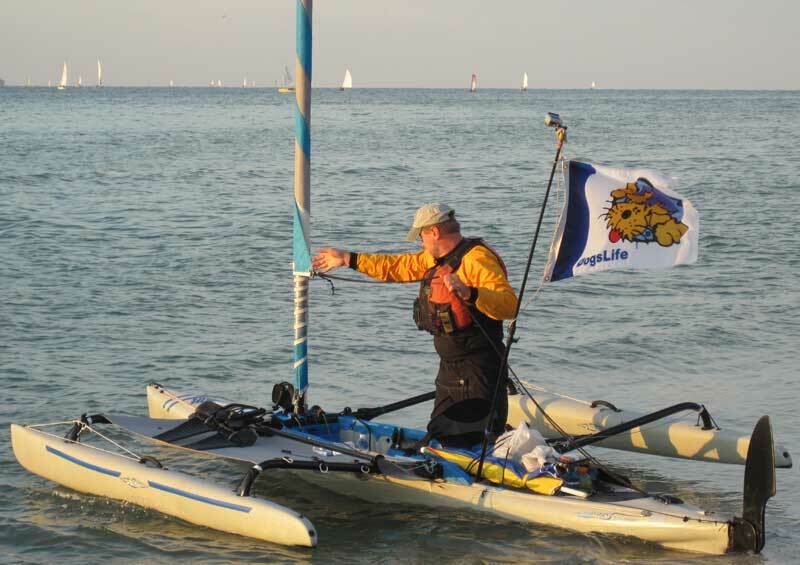 This Epic kayak paddler did not have a Watertribe name on his boat, but browsing through the roster I found that LifeAquatic was listed as competing in an Epic 18x with PAS. A little further research led me to find that PAS stands for Pacific Action Sail. So that's what those V-shaped sails are! 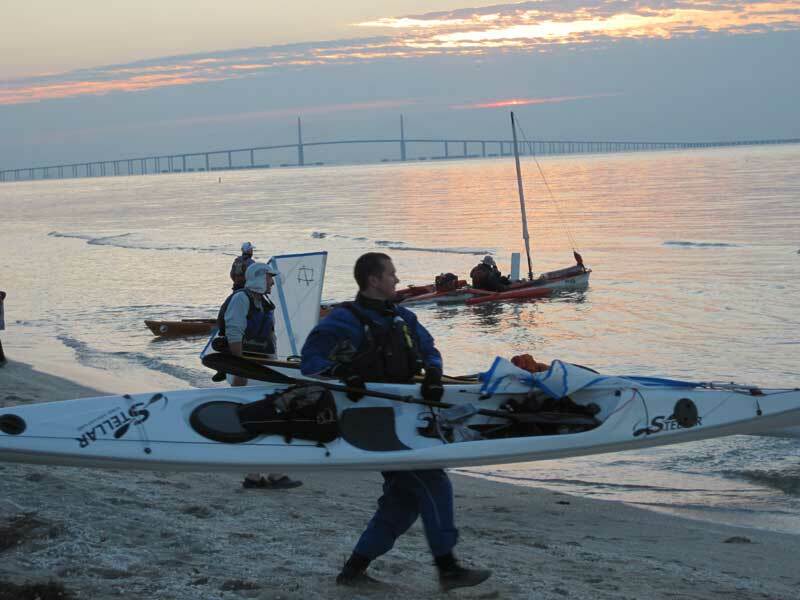 I'm not sure whether this is a picture of LifeAquatic, as there were others competing in Epic kayaks who may not have mentioned carrying a sail rig. Rigged as shown, it looks like an effective downwind booster. 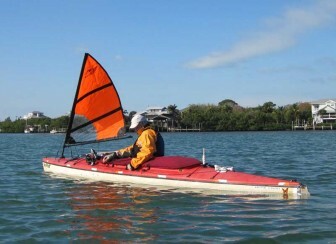 A discussion on a kayaking forum mentioned tilting and angling the sail like a crab claw rig for reaching. 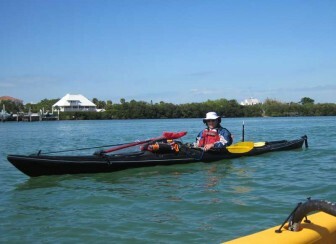 I learn something new from every Everglades Challenge! 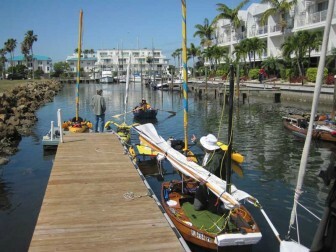 Following the Epic out from the marina was Sundance. There is a Watertribe racer going by that name, but he is listed as competing in a Class 1 kayak. In this case, the boat is the sweet little sloop named Sundance and I'm not sure who the sailor is. 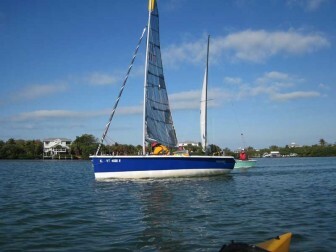 He seemed to be enjoying himself and was moving along pretty quickly with the double-reefed mainsail. With effective sailing ability and those nice, long oars, this looks to me like a great boat for the event. Wish I knew what it is. Update: That sailor is Watertriber wildblue, who chimed in on the forum and told me that Sundance is a Sirocco 15. 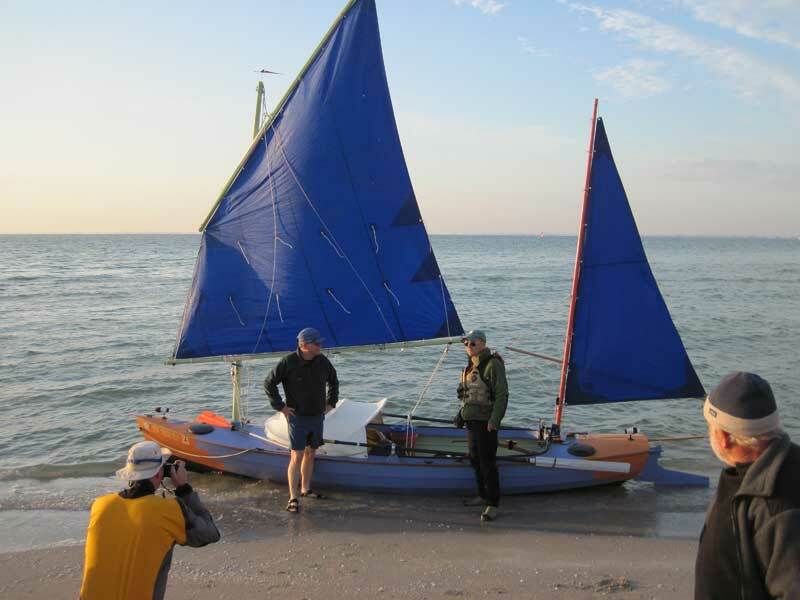 Shortly before 11 am, about three hours after their arrival, I saw brothers Phoenix 1 and 2 leaving the marina in their Phoenix Beach Cruiser, looking rejuvenated from their break. I told them they had what I thought was the best looking boat in the Challenge this year and one responded that the other had built it. This is how the mental illness that makes people want to build boats when there are always plenty of perfectly good ones already built and for sale spreads. Admiring their little boat, I could not help but think that it would be nice to build a boat and take it to events like this one. Darn boat builders have infected me with their disease! I guess there are worse fates in life! 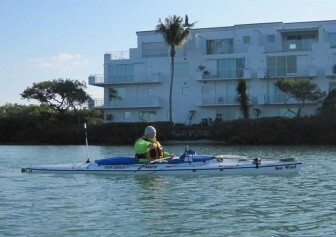 The last paddler I saw leaving was this sleek, black kayak, departing the marina just after 11 am. With no more arrivals and departures slowing to a trickle, I decided to call it a day. As I pedaled back into the docks in the marina basin, I could see the awards presentation for the Ultra Marathon participants. Each racer got a souvenir paddle and a round of applause as the names were called out. 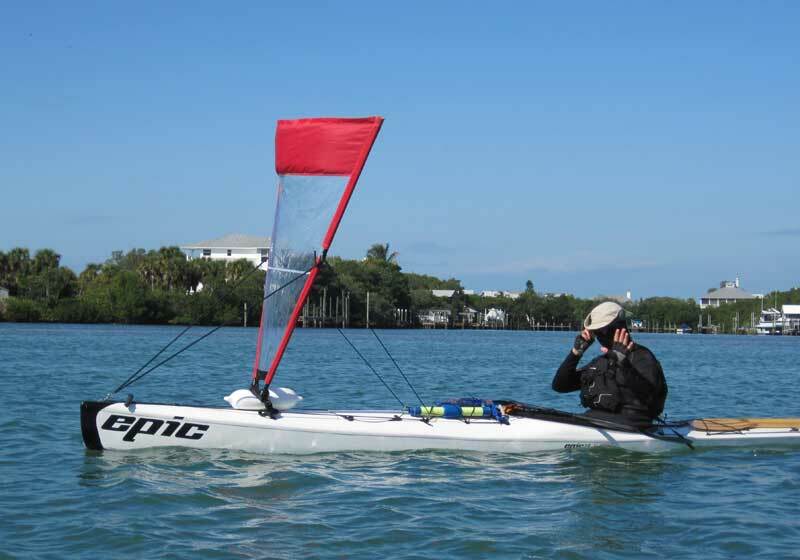 I started thinking that perhaps I should take a cue from CaptShallowWater and just do the Ultra Marathon before attempting the full Everglades Challenge, adding on my own "Shell Creek Challenge" to the end of the race. It is about 30 nautical miles from Cape Haze Marina to our house on Shell Creek, depending on the route chosen. 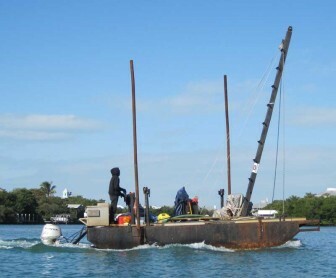 That's about as far as Captain ShallowWater had to sail home to Fort Myers, but part of it is in the winding, narrow sections of Shell Creek and there are two low fixed bridges. 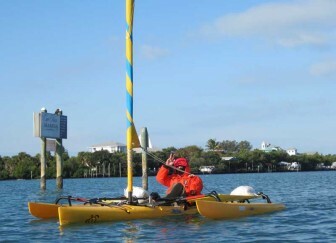 It might be fun, and would at least give me some idea of what it would be like to do the Everglades Challenge. After folding my Adventure Island and pulling it up onto the dock, I went to find Floatsome and once again ask for his help in moving my boat back onto the trailer. He looked worn out from helping all the race participants and no doubt getting little or no sleep during the previous night, but helped me anyway. 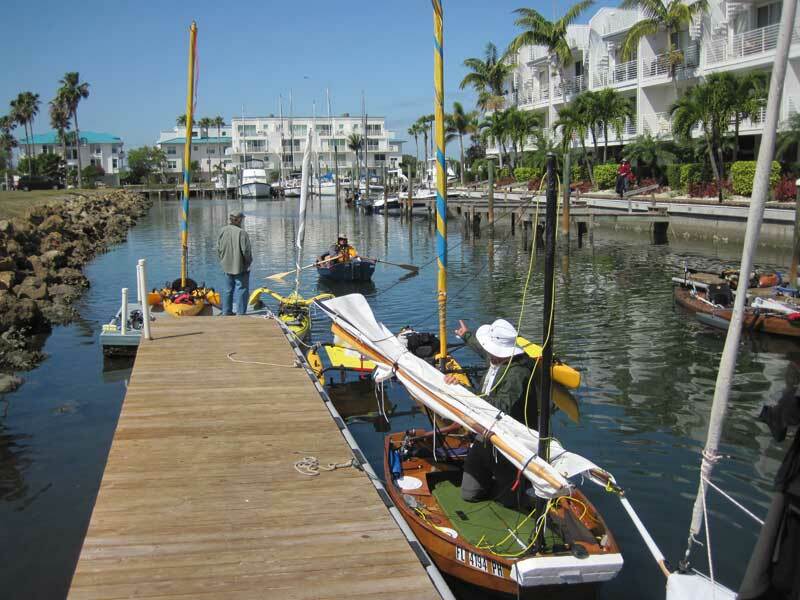 The picture at left shows the custom kayak/trimaran Swamp Monkee beside my boat on the floating dock and the sailor in the little blue pram heading out to continue his Everglades Challenge adventure. I could not work out going to Chokoloskee or Flamingo to continue watching the racers this time around, so that's all for this year!